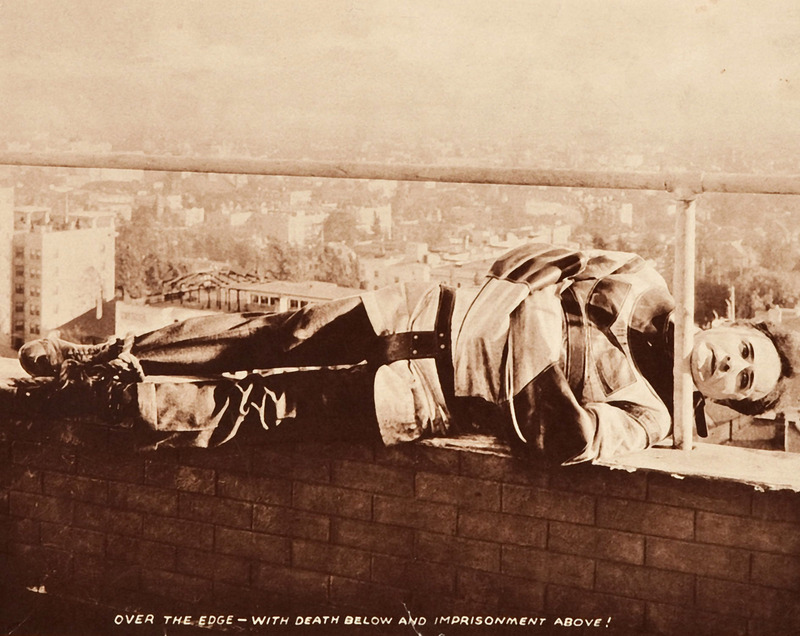 Over the edge – with death below and imprisonment above! 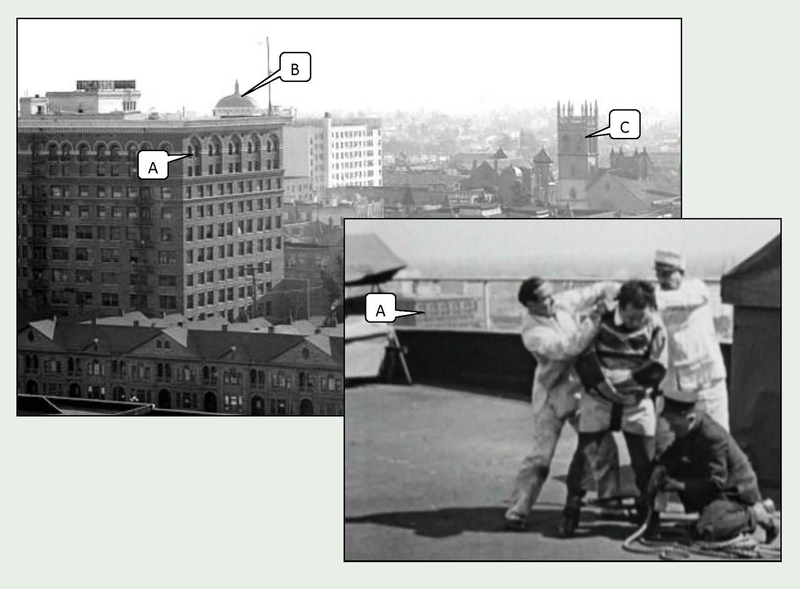 Harry Houdini in The Grim Game (1919), taken on the roof of the former Habour Apartments, discussed below. After shooting a 15-part serial The Master Mystery, world famous magician and escape artist Harry Houdini made his feature film debut in 1919 with The Grim Game, screening at the San Francisco Silent Film Festival’s special A Day of Silents held at the Castro Theater this December 5. Billed as a stirring story of love, mystery, and dare-devil adventure, The Grim Game was scripted to maximize opportunities for Houdini to escape from various traps and shackles on screen. 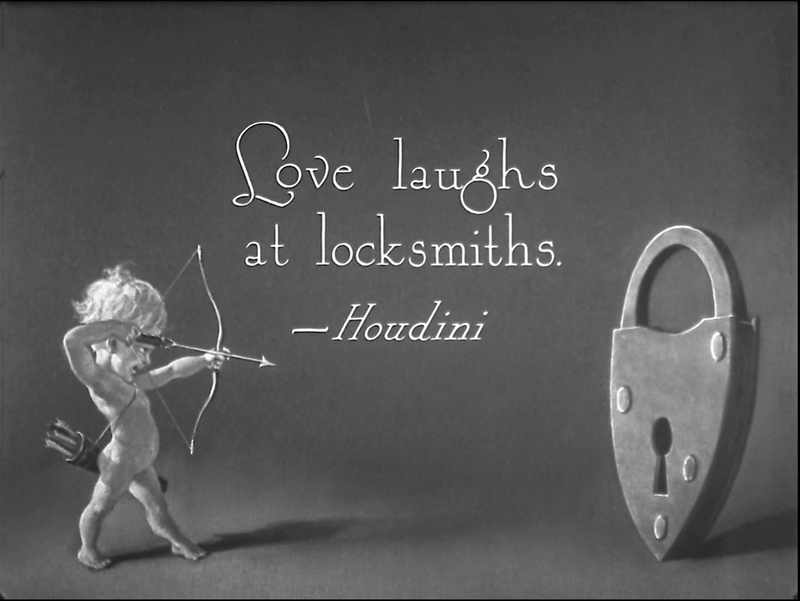 As discussed in my previous post, Buster Keaton dedicated his most famous short film Cops (1922) to Houdini, while crediting Houdini in his autobiography for giving Keaton his first name. Remarkably (could it be just a coincidence?) Keaton staged three scenes from Cops at places where Houdini had filmed previously. See Houdini – Keaton – The Grim Game – Cops. 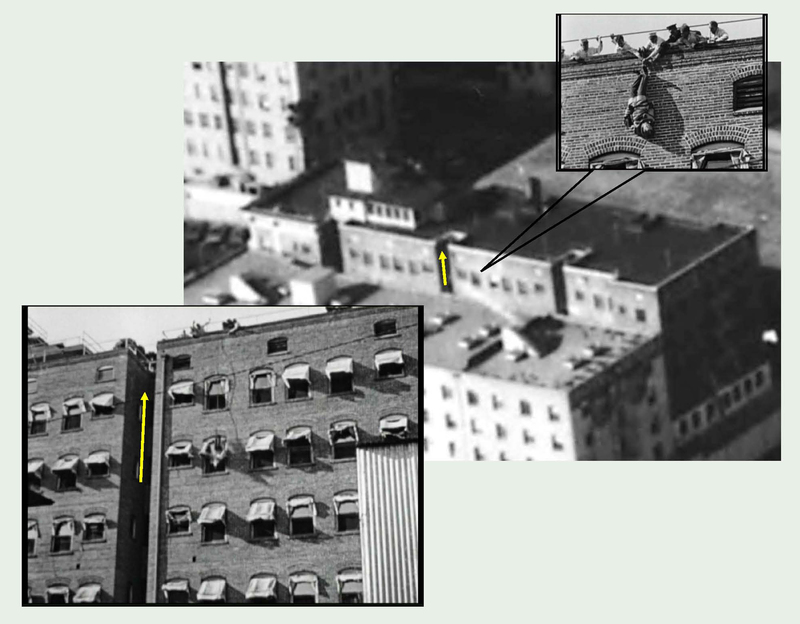 While The Grim Game is noteworthy in part for a real-life plane crash caught on film (no one was hurt, see my prior post), Houdini’s roof-top escape from a straight-jacket (above) may be the most thrilling moment in the picture. 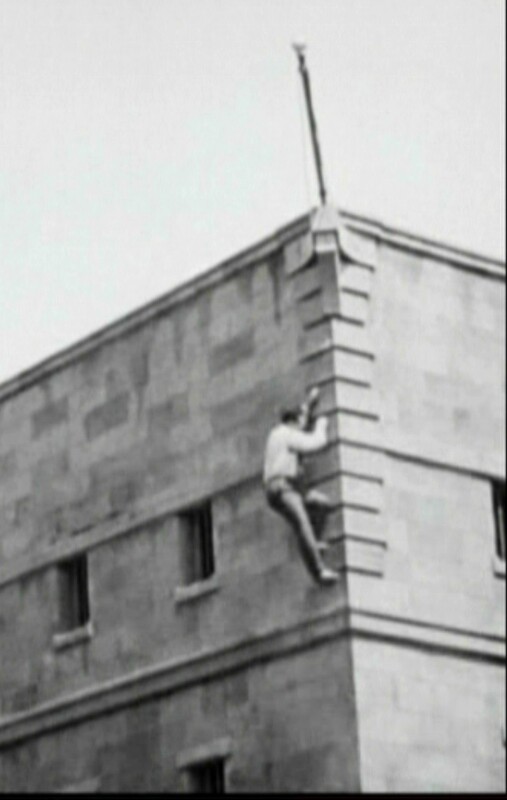 The stunt was preceded by his escape from what appears to be the interior of the Los Angeles County Jail. 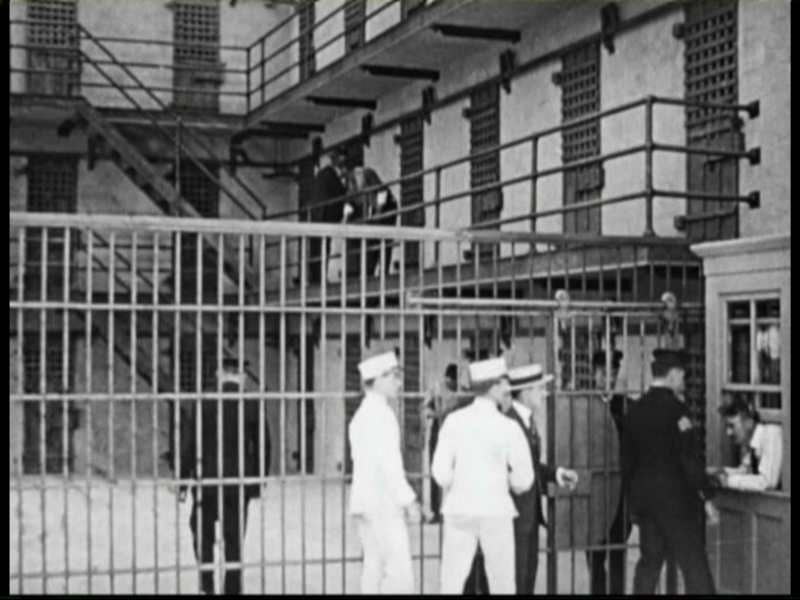 (I’ve never seen images inside the jail, but since they filmed exterior scenes beside the jail (below), and Houdini commonly performed escapes at real jails, it’s reasonable to assume they filmed inside the jail too – a fine example of how cinema often preserves history in real life. The jail interior (upper right) also looks too elaborate to be merely a set). 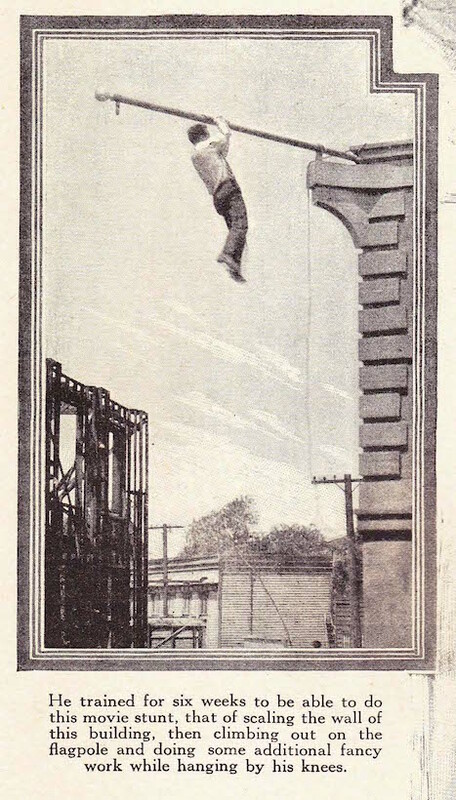 At left, this view (John Cox) shows Houdini hanging from a studio jail set for a different stunt. The LA County Jail as it appears in The Grim Game. 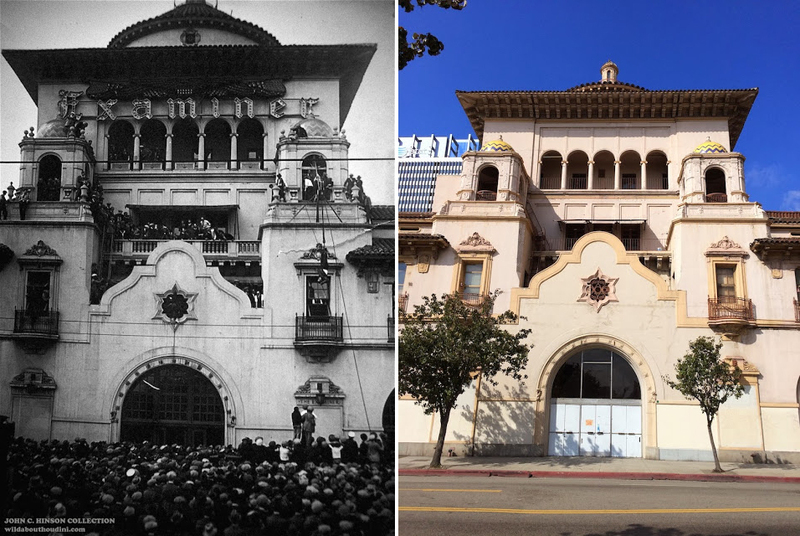 Once part of the Civic Center, the jail appears during D. W. Griffith’s Intolerance (1916) and in many other early films (see link here), and stood on Temple across from the former LA County Court House where Houdini posed for publicity photos covered in my prior post. Photo from Harold Lloyd estate. Harbour Apartments – A Visit to Old Los Angeles. chased onto the roof, Houdini is re-captured and trussed in a straight-jacket, his ankles tied with rope. Breaking free again, Houdini falls over the edge of the roof, suspended upside down, but escapes the jacket and his captors before the rope breaks. 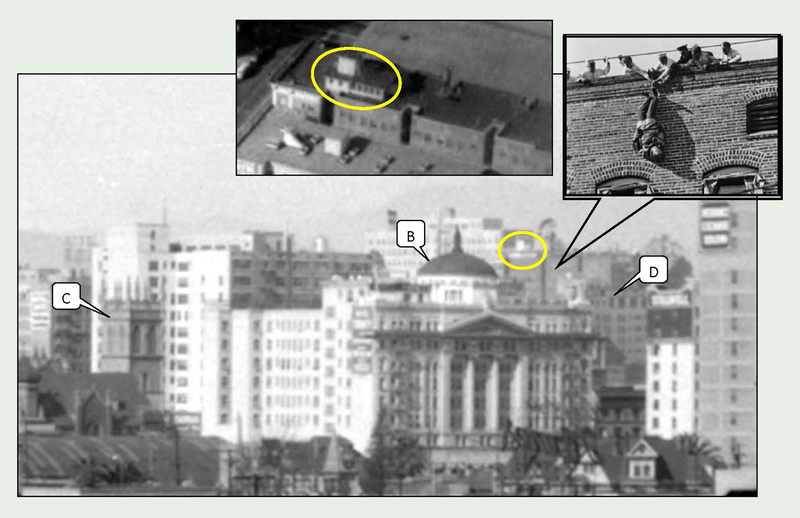 This sequence was filmed on the roof of the now lost Harbour Apartments at 612 St. Paul Street. 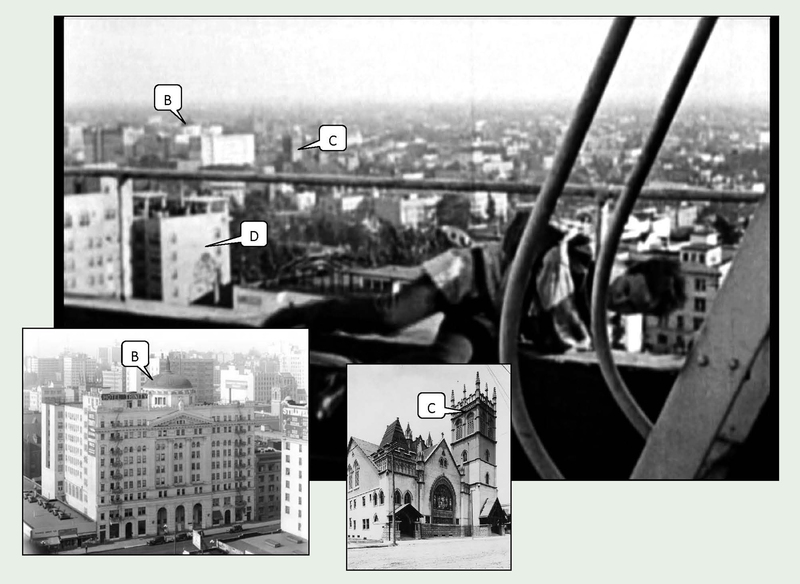 While the image quality could be better, during the scene I immediately spotted two landmarks nearly aligned with each other, the squat ‘chocolate drop’ dome tower of the extant Hotel Trinity and Auditorium at 851 S. Grand (left, LAPL), and the distinctive twin steeples, now lost, of St. Joseph’s Church at 1200 S. Los Angeles Street (LAPL). 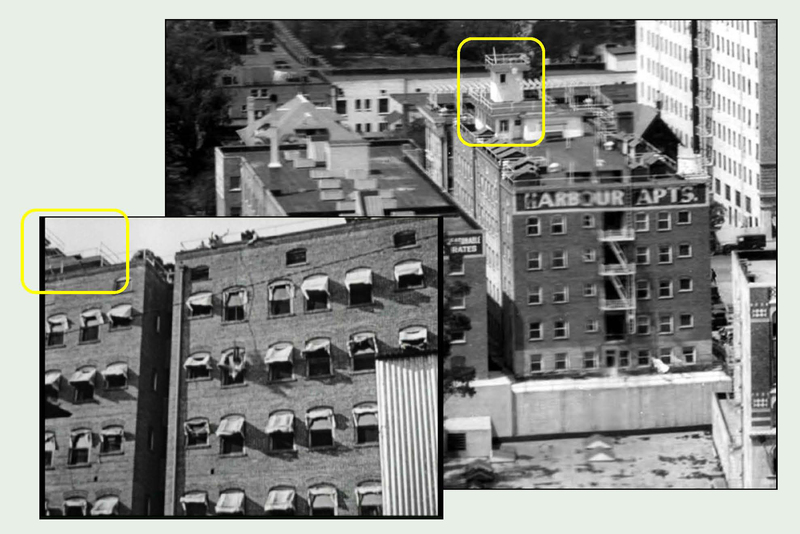 By reversing my orientation, and tracing a path NW from the church through the auditorium, I ended up with a narrow range of candidate apartment houses, and quickly spotted the Harbour Apartments in a panoramic photo – USC Digital Library, while also identifying other landmarks (A-D) appearing in the film. 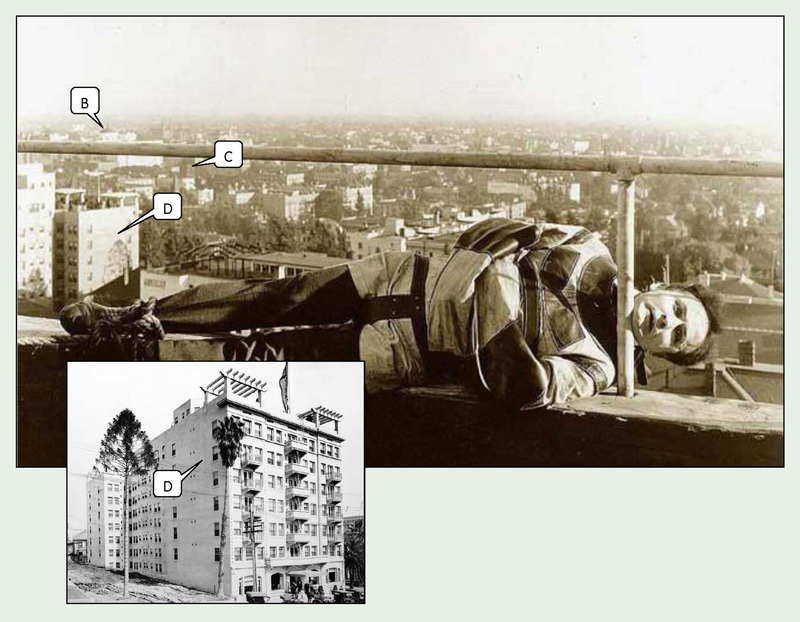 Houdini clings to life over the edge of the Harbour Apartments at 612 St. Paul Street – its southern neighbor, the Hotel Victor at 616 St. Paul, was built in 1924 long after Houdini filmed there. USC Digital Library. Looking SE this detailed view shows the Trinity Hotel and Auditorium (B) and the lost First Congregational Church (C) once standing at 841 S. Hope Street. LAPL. (D) marks the lost Rex Arms Apartments. 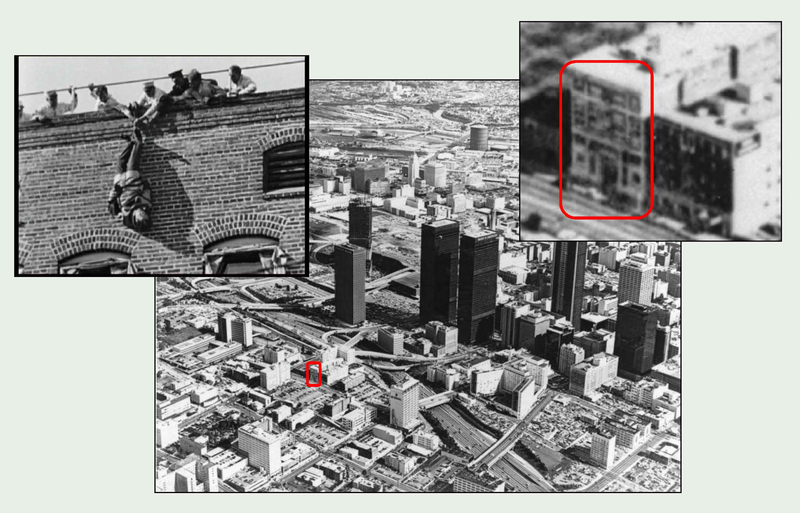 Both images show the west side of the Rex Arms (D) at 945 Orange (later Wilshire) – now lost. USC Digital Library. Charlie Chaplin and Roscoe Arbuckle filmed The Rounders there in 1914 as reported HERE. This view shows (A) the YMCA Building, built in 1908, now lost, at 719 S. Hope, along with the Trinity (B) and First Congregational Church (C). USC Digital Library see page 11. This final SE view reveals, to the left, the north side of the extant Hotel Stillwell that still stands on Grand Ave. across from the extant Trinity, center. 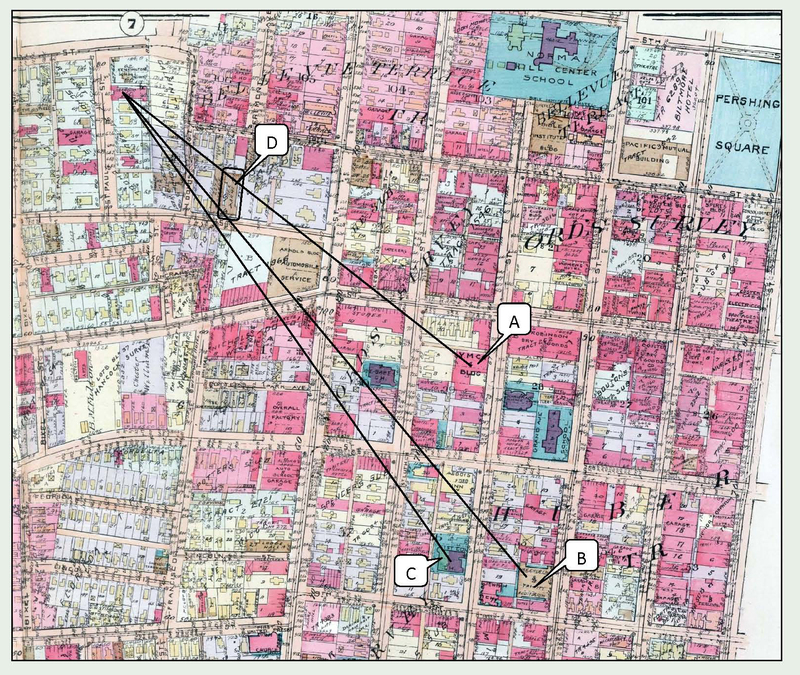 The right line leads to the lost First Congregational Church. USC Digital Library. 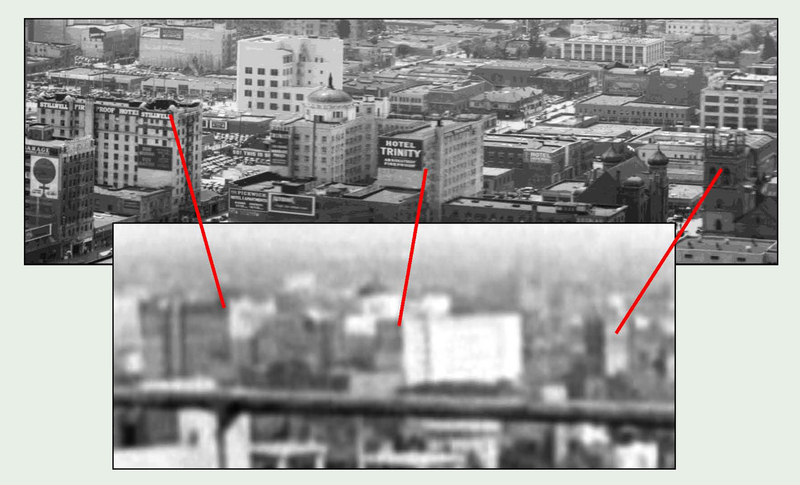 This view looking NW from the extant Graphic Arts Building at 417 E. Pico clearly reveals the Harbour Apartments at back behind the noted landmarks (C), (B), and (D). Huntington Digital Library. 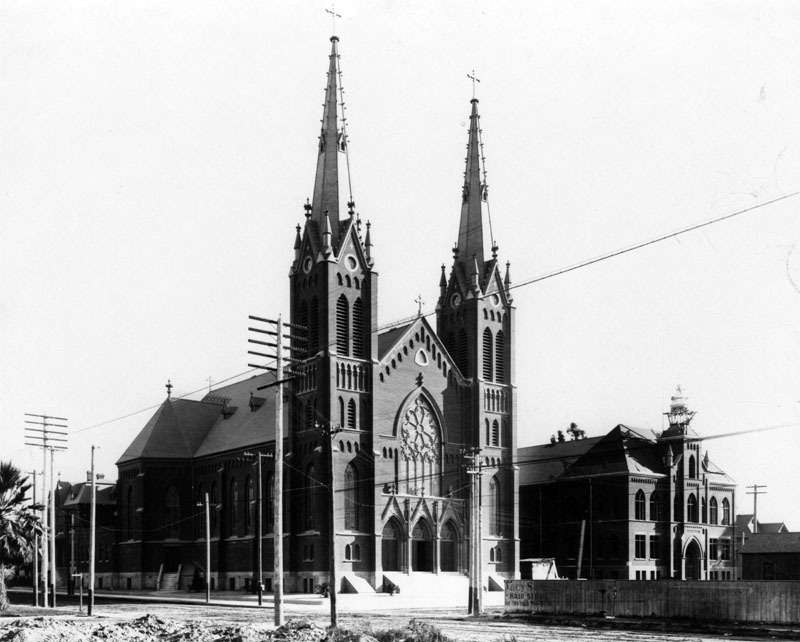 The full view of this panoramic photo shows the back of the St. Joseph Church steeples to the left as well. The face of the Harbour Apartments on St. Paul Street. Both it and the Hotel Victor next door were demolished in the 1980s. USC Digital Library. While the filming of Houdini’s straight-jacket escape was not likely publicized to avoid crowds of onlookers during the shoot, Houdini staged a similar stunt (where else to maximize publicity?) 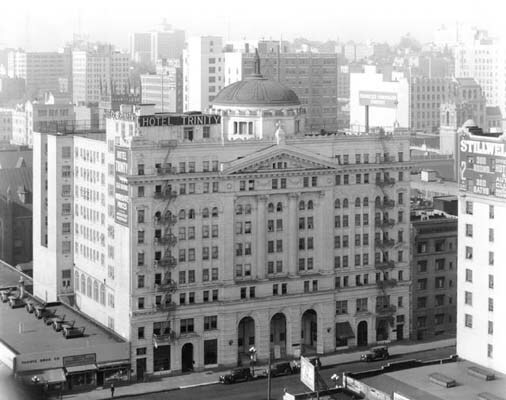 at the front offices of the Los Angeles Herald Examiner newspaper at Broadway and 11th as shown below. 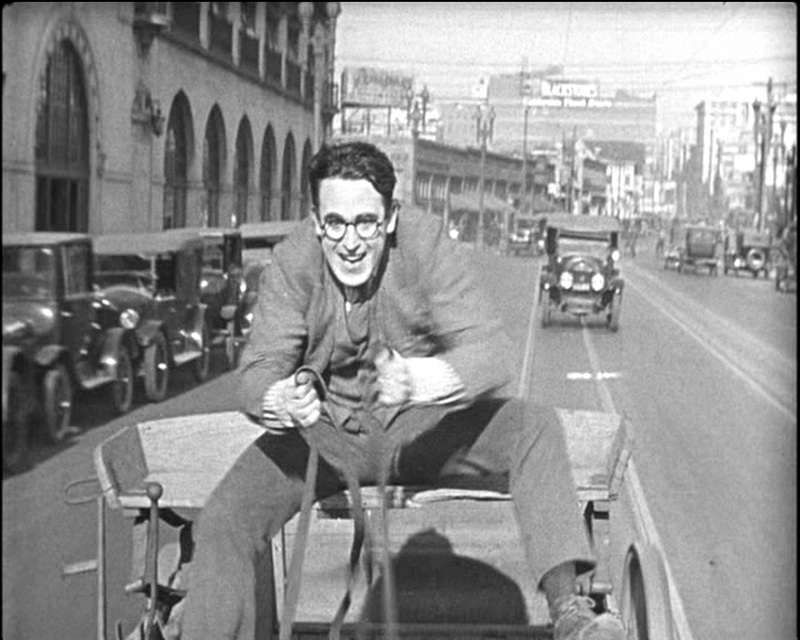 At left, Harold Lloyd raced past these offices during his frantic dash to the altar in Girl Shy (1924). John Cox reports in his amazing Houdini site that Harry performed his downtown straight-jacket escape below on April 5, 1923. You can read more about it at John’s story HERE. The film’s restorer Rick Schmidlin will introduce The Grim Game at The San Francisco Silent Film Festival’s A Day of Silents this coming December 5 at 3:00 p.m. at the Castro Theater, to be accompanied on the piano by Donald Sosin. The Trinity Hotel appears during Charlie Chaplin’s The Bank (1915) and in Harold Lloyd’s 1919 shorts Bumping Into Broadway and High and Dizzy. You can read about them filming at the Trinity HERE. Chaplin beside the Trinity in The Bank. For a more complete account about The Grim Game, check out Mary Mallory’s post on the Daily Mirror blogsite. Looking north up Grand at two surviving buildings visible during The Grime Game, the Trinity Hotel at left, and the Hotel Stillwell. 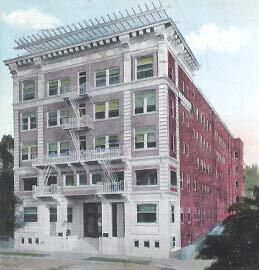 This entry was posted in Harry Houdini, Los Angeles Historic Core, The Grim Game and tagged Harry Houdini, Herald Examiner Building, Los Angeles County Jail, Los Angeles Historic Core, Rex Arms, Silent Movie Locations, Silent Movies, Stillwell Hotel, straight-jacket escape, The Grim Game, then and now, Trinity Hotel. Bookmark the permalink. Thanks John! Great stuff here! A bit confusing but great! John – thank YOU for all of your wonderful research and stories about the incredible Harry Houdini at WildAboutHoudini.com, for generously sharing your photos with me, and for your kind words. Confusing or not, your photos, research, “triangulations” and story-telling are always, always, fascinating and compelling.